Summary: Ryan shows you how to convert from shutter speed to shutter angle and back again. In this video I’m going to show you how to convert your shutter speed to shutter angles and back again. So if you find yourself in the situation where you need to convert from shutter speed to shutter angle, here is the equation that you need to use. You take your frame rate, multiply it by 360, and then divide by your shutter speed. So lets say you needed to figure out what the shutter angle is for 1/50 of a second at 24 frames per second (fps). Is would be 24 times 360 divided by 50, or 172.8 degrees. Now lets say you needed to go the other way: you use the same equation, only this time you divide by the angles. So if you wanted to find out what 180 degrees is in shutter speed at 24 fps, it would be 24 times 360 divided by 180, which equals on forty-eighth of a second. If you have any comments or questions, leave them in the comment section below, and then come join me in the next video. Thanks Ryan very simply explained, I definetly think your academy is a great learning place! Hello Ryan, thank you for making so great video. When the camera can choose shutter speed and angles at the same time, which I should put on light meter to use? I mean, for example, I set 180 degree ,24fps, but 1/400 shutter speed. [some people say fast shutter speed for freeze move is easier to do green/blue key. So I guess I would use 1/400 on light meter to measure. Is it correct? Thank you. Shutter speed and shutter angle are referring to the same thing- how long the shutter is open on the camera. So at 24 fps, it would be impossible to have a shutter of 180 degrees and a shutter of 1/400. At 24 fps, 180 degrees equals a speed of 1/48. (A shutter of 1/400 at 24 fps equals about 22 degrees.) So you can either have a shutter of 1/48 (180 degrees) or 1/400 (22 degrees), but not both. If your question is just whether to put shutter or degree on the camera and on your meter, then I would make your camera and meter match. If your camera only shows speed, make your meter read in speed. If your camera only shows degrees, make your meter read in degrees. If your camera does both, choose the one that makes the most sense to you, and then make your meter match. Shutter angle dates back to the days when there was a rotating disk that acted as the shutter for film motion cameras. Depending on how much of an angle was cut out of the disk, the shutter was open longer or shorter. While most cameras no longer use this measurement now that so many are switching to digital cameras, it is still important to understand what shutter angle is. Plus if you are in the industry long enough, you will most likely need to know the conversion since some high end digital cameras (like the ARRI Alexa and Blackmagic Cinema Camera) still use this measurement. There is also the chance that you’ll work with film motion cameras since they are still used due to their artistic quality. 1. explain minimum and maximum shutter angle use? 2. is necessary to change shutter angle when frame(24fps) rate increase or decrease? 1) Making the shutter angle smaller is equivalent to having a faster shutter speed. Making the angle larger means a slower shutter speed. These affect the amount of blur in the image, just as shutter speed affects blur. There are also minimum and maximum shutter angles based on physics. The max will probably be 360 or close to it, meaning the sensor is constantly open. Shutter speed example would be 24 fps with a 1/24 sec shutter. Minimum could be a small slit, just enough to let some light through. This would also require very bright lights. 2) For normal motion blur, an angle around 180 is used. If your recording framerate will be the same as the playback framerate, then you don’t need to adjust the shutter angle. Example: if you are filming a 48 fps shot but will also be playing it back at 48 fps, then 180 degree shutter will create a normal motion blur. However if you are filming at 48 fps and you will play back at 24fps, then you have to decrease the shutter angle to 90 degrees to create a normal motion blur at that reduced play back speed. I understand what your saying and agree with everything up until the last part on decreasing the shutter angle to 90 degrees to create a normal motion blur when shooting at 48fps and playing back at 24fps. If your shooting at 48fps from 24fps you’ve lost a stop of light and changing the shutter angle from 180 degrees to 90 degrees would darken the shot and lose you another stop of light wouldn’t it? I agree closing the shutter would give a less blurred shot but I don’t think this is necessary when your shooting at a high frame rate to get slow-motion, as this is when more light is most important. 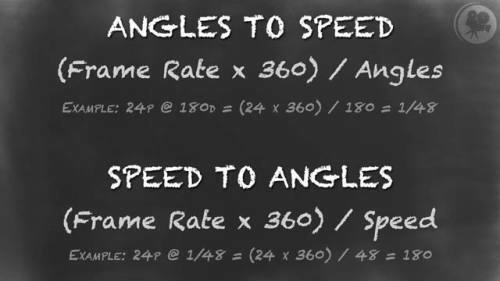 Also when you are shooting at a higher frame rate there is no need to change your angle/speed as the frames are passing faster infront of the sensor giving them less time to actually blur. So technically there is no need to close the shutter angle any more. Personally I believe the correct thing is to either stay at 180 degree and get more light into the shot or even open the shutter to around 345.6 degrees to get your stop of light back. I do agree with most of what you’ve said though and I do have one question I was wondering if you could help me with. As I’m sure you know in Europe it is 50HZ and 60HZ in other countries (like America). Every set I’ve been on the frame rate has matched the shutter angle e.g. 24fps = 172.8 degrees and 25fps = 180 degrees. Until I saw recently on a shoot in America (where its 60HZ ) the movie been shot at 24fps and 180 degree shutter angle. Why would this be? Shooting at higher speeds requires more light as we discussed in our module on filming at extreme frame-rates. You are correct that going from 24fps to 48fps at the same shutter angle would lose one stop of light, and going from 180 degrees to 90 degree shutter angle would lose an additional stop of light, totaling two stops of light. From there your answer differs from mine solely because our creative choices are reflecting our priorities. For you, getting enough light is most important. For me, getting the correct motion blur is important. My goal is to make the slowed down image continue to be aesthetically consistent to the rest of my hypothetical project. If I went with a 180 degree shutter there would be twice as much blur, and something close to 360 degrees would be four times more blurry than my suggestion of 90 degrees. For objects that are moving slowly this might be fine, but if I was filming a runner or a sports car this blur would be objectionable. As for the frames passing faster in front of the sensor, you are correct. But since I’m slowing down those frames in post, it will still be noticeable. For your dilemma of losing light I would suggest trying to bring in bigger, brighter lights to illuminate your scene. Your questions about shutter angle on sets with 50Hz vs 60Hz power tells me you are in Europe. The reason I know this is that shooting 24fps with a 172.8 degree shutter is to solve flicker from HMIs and fluorescents on 50Hz power. Since you’re in Europe, this is what you see all the time on set. At 25fps on a set with 50Hz power, 180 degree shutter eliminates flicker from those types of lights. In America where the power is 60Hz things are reversed: at 24fps the shutter angle can be 180 degrees. If a project was being filmed in America to be shown in Europe — and therefore shot at 25fps — the shutter angle would need to be adjusted to 150 degrees to eliminate flicker. Check out these charts from Cinematography Electronics, Inc that show shutter angles and frame rates at 50Hz vs 60Hz.